Aspects of Leadership: Why do so many managers act like jerks? Business Ethics Blog Aspects of Leadership: Why do so many managers act like jerks? without properly acknowledging successes and accomplishments? We’ve all had people in our lives that yell, curse, insult and demean with sarcasm or mean-spirited jokes. We’ve seen bosses criticize subordinates in front of others, threaten demotion or termination, and talk to adult subordinates as if they were children. If we’re honest we might acknowledge we have occasionally done some of these things ourselves. Can anyone really believe that causing resentment, fear, or insecurity will produce better results than pride, self-confidence, and enthusiasm in the long run? If not, why do so many otherwise competent people engage in intimidating and disrespectful management practices. And even more important, why do the people they report to tolerate it? (Remember there is never just one bad employee. There is always another who allows the behavior rather than retraining or replacing the bad employee). I suggest there are three possible reason: 1) they don’t realize they are being jerks; 2) it works in the short run; and 3) it is tolerated or sanctioned by their own bosses. Some managers intentionally use negative tactics because they think it’s an effective way to get people to do what they’re told and they will defend their behavior with claims of past success. They view being nice as unnecessary and possibly a weakness. These managers could not survive for long without upper management support so their management style is effectively validated by the fact that they are still the boss. This is relatively rare. In fact, most managers characterized by the people who work for them as rude, inconsiderate, or abusive are totally unaware of how inappropriate or counterproductive their attempts to motivate are. They think they’re just being tough. They think people get them. They think that their sarcasm is appreciated as clever and incisive oblivious to the reality that the people they supervise are more likely to feel fear and contempt. Like a person with bad breath they need someone to point out the problem in a constructive manner. Bosses who do not have the insight to know or the courage to confront abusive managers who report to them are themselves problem employees who must be retrained or replaced. Some managers use negative techniques our of ignorance – they never learned any other method — and some out of frustration – they’ve tried more cordial approaches and can’t get the results they need from the employees they have. In this case the management problem is how to retrain or replace the inadequate employees, not how to coerce them to perform. Again, the problem comes to the desk of upper management to provide the training, resources and oversight to make abusive leadership unnecessary. Many good people act badly when they become the boss because they’re under pressure from their own boss to get results. Maybe they’re simply mimicking the management styles of people they worked for. Or maybe they want to distinguish themselves from ineffective managers on the other extreme who try so hard to be everyone’s friend that they don’t set or achieve high goals or hold people accountable. Whatever the reason, a far better approach is to treat everyone with respect by engaging and empowering others through inspiration and example. The best leaders bring out the best in people by making them feel good about themselves and their capabilities. And the best leaders assure that the leaders that report to them do so. Inspiration is much more powerful than intimidation. Leadership is not a matter of authority, it is a matter of influence. 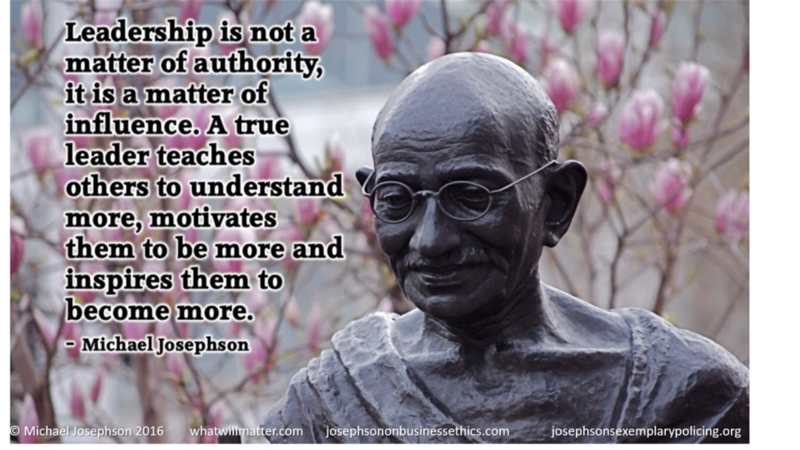 A true leader teaches others to understand more, motivates them to be more, and inspires them to become more.